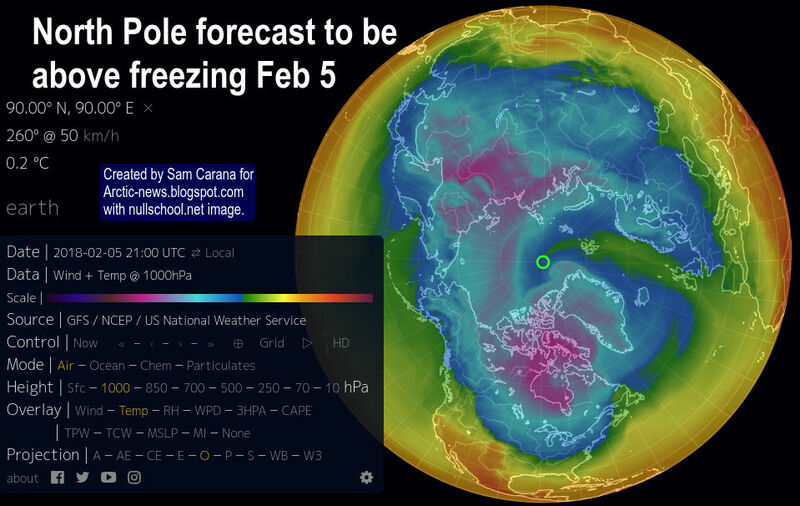 The image below shows a forecast of above freezing temperatures over the North Pole on Feb 5, 2018. Above image shows a forecast of air temperature of 0.2°C or 32.4°F at 1000 hPa over the North Pole on February 5, 2018, 21:00 UTC. Above image shows a forecast of temperatures of 1.1 °C or 33.9°F at the North Pole at 1000 hPa, on February 5, 2018, 18:00 UTC. Above image shows a large area around the North Pole forecast to be up to 30°C or 54°F warmer than 1979-2000 on February 5, 2018. 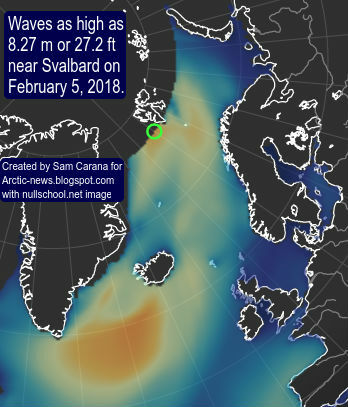 Above image shows sea surface temperatures as high as 15.1°C or 59.2°F near Svalbard on February 9, 2018, in the panel on the left, and air temperatures as high as 6°C or 42.7°F (at 1000 hPa) near Svalbard on February 10, 2018, in the panel on the right. 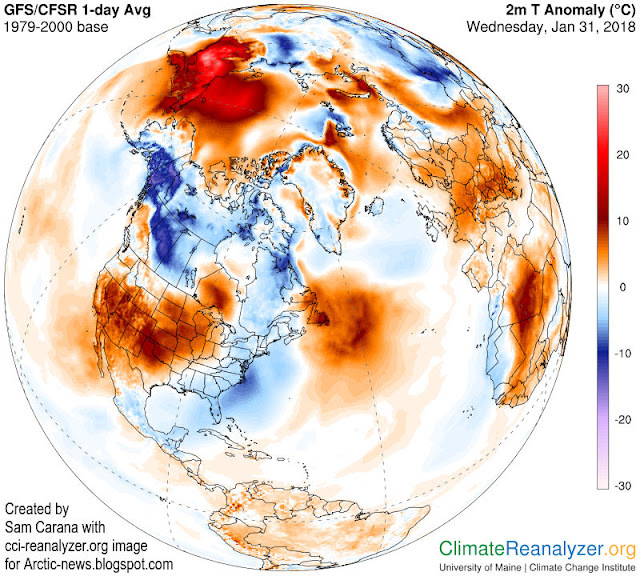 These high temperatures are caused not only by ocean heat, but also by strong winds pushing warm air and water up from the North Atlantic into the Arctic. 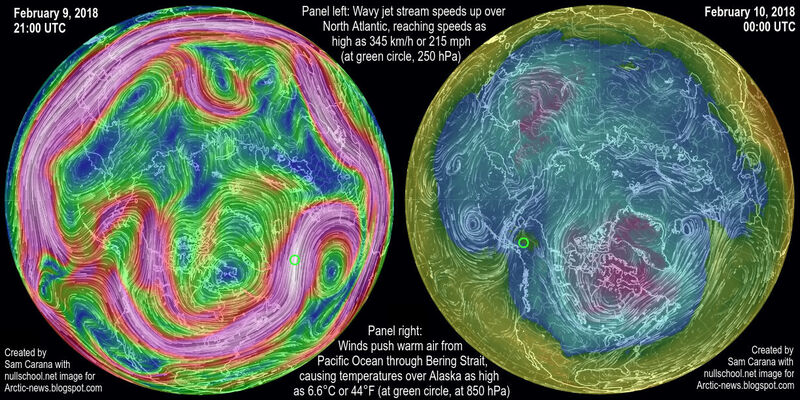 Above image shows the Jet Stream moving at speeds as high as 315 km/h or 196 mph (green circle, February 6, 2018, 6:00 UTC), moving in backward direction over Scandinavia, while extending over Antarctica and crossing the Equator at a number of places. The decreasing temperature difference between the North Pole and the Equator is slowing down the speed at which the jet stream circumnavigates Earth and this is also making the jet stream more wavy. 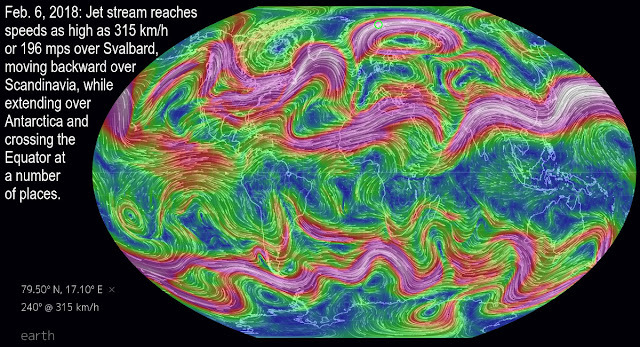 As a more wavy jet stream extends deeper down over land, it allows cold air from the Arctic to flow down over land. As temperatures over land fall, the difference between ocean temperature and land temperature increases, especially in winter when land temperatures are much lower than ocean temperatures. This increasing difference between land and ocean temperature makes winds stronger and faster over oceans. In above image, the left panel shows a wavy jet stream speeding up over the North Atlantic, reaching speeds as high as 345 km/h or 215 mph (at green circle, 250 hPa). In above image, the right panel shows strong winds pushing warm air from the Pacific Ocean through Bering Strait, resulting in temperatures over Alaska as high as 6.6°C or 44°F (at green circle, at 850 hPa). The image on the right shows that waves as high as 8.27 m or 27.2 ft (at green circle) are forecast to enter the Arctic Ocean near Svalbard on February 5, 2018, giving an indication of the huge amount of energy that is going into oceans. Earth is retaining more heat. This translates into higher surface temperatures, more heat getting stored in oceans and stronger winds. This in turn is causing higher waves and more evaporation from the sea surface. 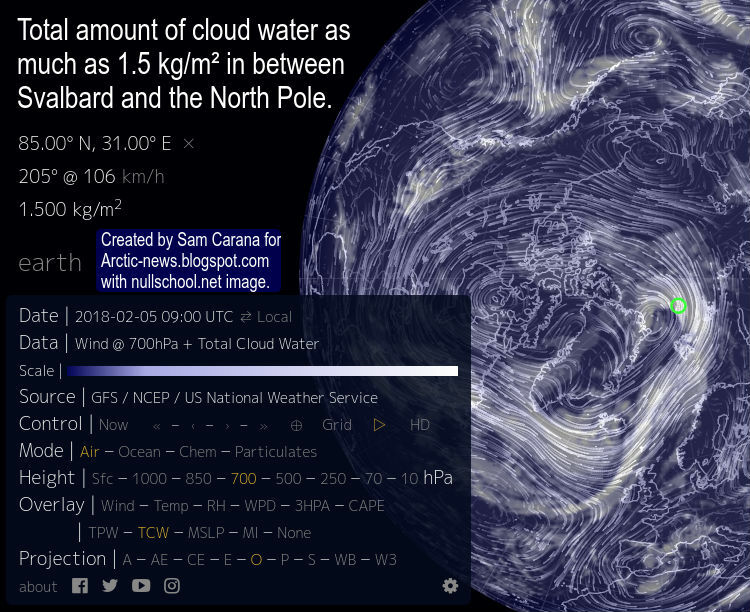 The image on the right shows a forecast of total amount of cloud water (in air from surface to space) of 1.5 kg/m² (green circle) in between Svalbard and the North Pole on February 5, 2018. 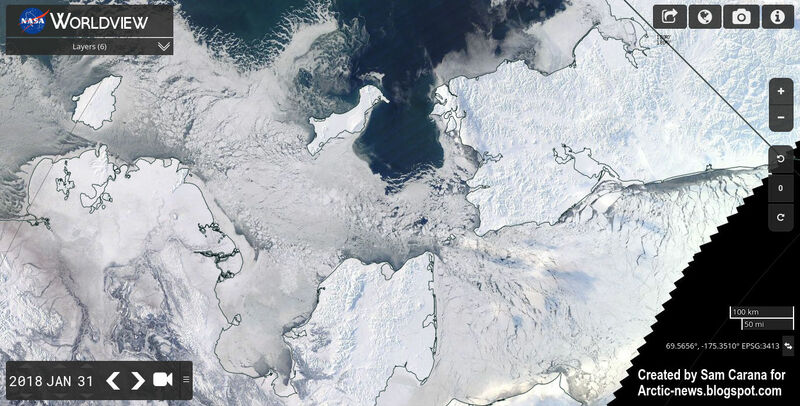 Warm air, warm water and high waves make it hard for sea ice to form, while evaporation from the ocean adds more water vapor to the atmosphere. 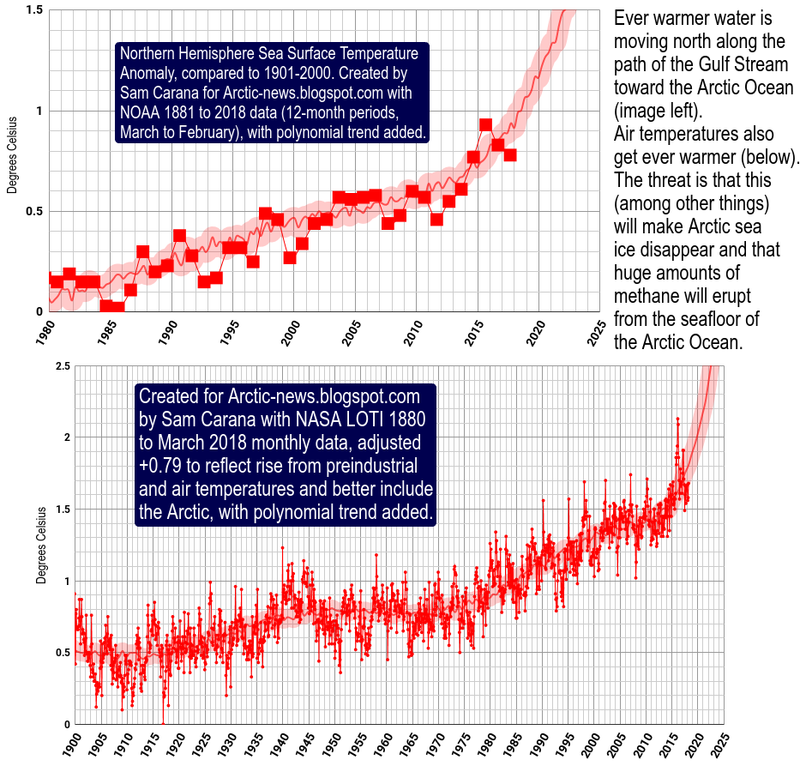 Since water vapor is a potent greenhouse gas, this further accelerates warming of the Arctic. 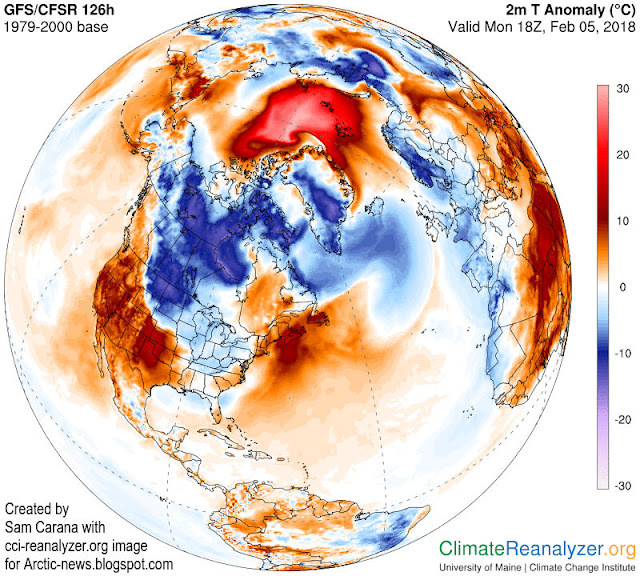 The high temperatures at the North Pole follow high temperatures over East Siberia, as illustrated by the image below. Above image shows average temperature anomalies for January 31, 2018, compared to 1979-2000. The image below shows open water on the East Siberian coast in the Arctic Ocean that day. Meanwhile, Arctic sea ice extent is very low. The image below shows that extent on January 30, 2018, was 13.391 million km², a record low for the time of the year. 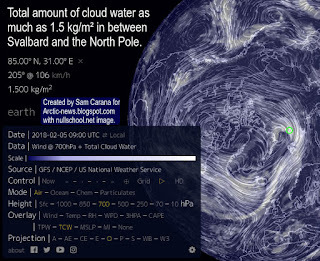 In the podcast below, by Wolfgang Werminghausen, entitled Sam Carana about the Arctic and global temperature, Sam Carana's responses are read by Kevin Hester. 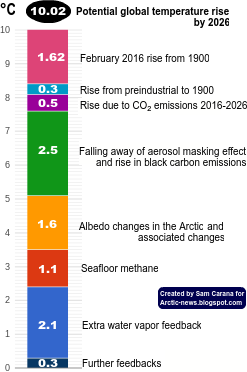 From the interview, Sam Carana: "Methane releases from the seafloor of the Arctic Ocean have a strong warming impact, especially locally, AND methane releases in the Arctic also act as a catalyst for other feedbacks that are all self-reinforcing and interlinked, amplifying each other in many ways. It could easily become 10°C or 18°F warmer in a matter of years, especially in places where most people are now living." 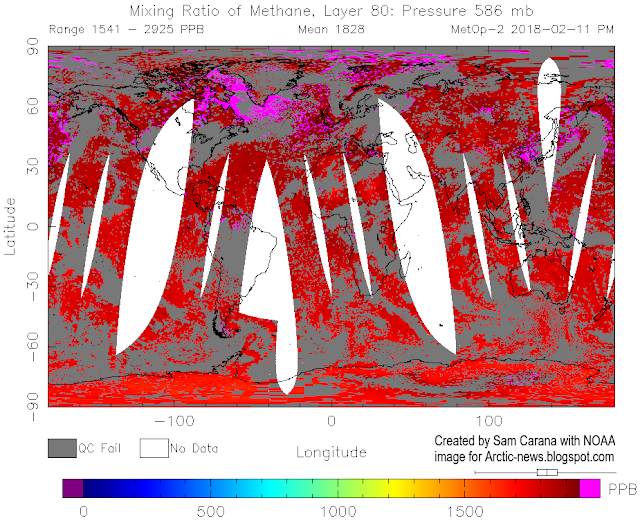 The image below shows that on February 11, 2018, methane reached peak levels as high as 2925 ppb. High methane peaks are becoming more common as the water temperature of oceans keeps rising, which also goes hand in hand with more water vapor and less sea ice. As said, these are all warming elements that amplify each other in many ways. 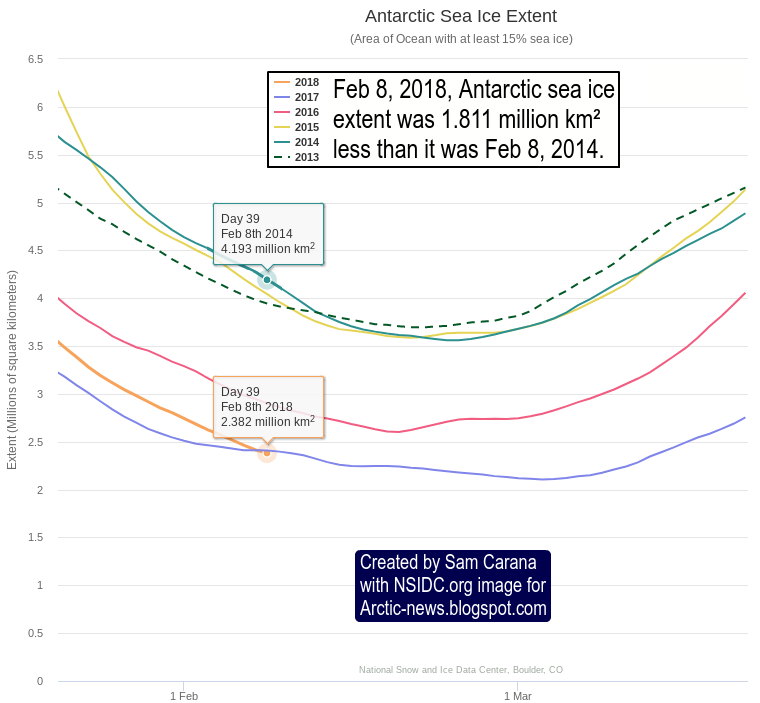 On Feb 8, 2018, Antarctic sea ice extent was 2.382 million km², a record low for the time of the year and 1.811 million km² less than the extent on Feb 8, 2014. 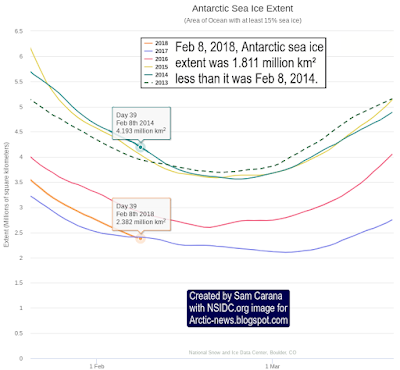 The image on the right illustrates the huge loss of sea ice around Antarctica over the past few years. 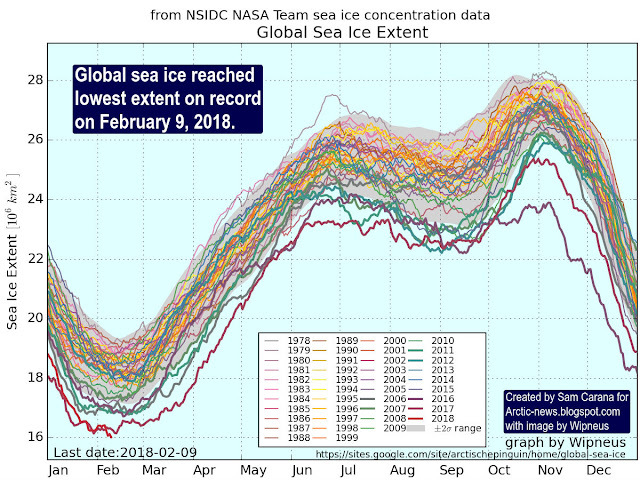 Antarctic sea ice looks set to reach an all-time low extent later this month, with a difference of close to 2 million km² persisting, compared to just a few years ago. The image below shows a forecast for February 5, 2018, with as much as 3.84 kg/m² (green circle) Total Cloud Water in between South Africa and Antarctica. 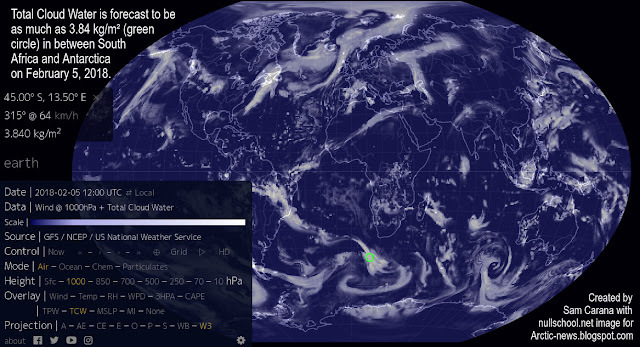 More water vapor in the air contributes to global warming, since water vapor is a potent greenhouse gas. The image below shows a forecast for February 5, 2018, with temperatures on Antarctica reaching as high as 8.9°C or 47.9°F (update Feb. 11, 2018: 7.1°C or 44.7°F at 78°S, 17°E at 1000 hPa on Feb. 5, 2018, 15:00z). 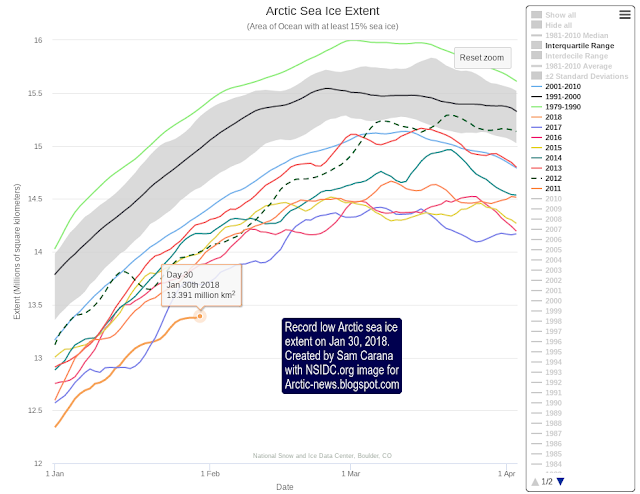 At this time of year, global sea ice is typically at its lowest extent for the year. On February 9, 2018, global sea ice reached the lowest extent on record, as illustrated by the image below by Wipneus. This means that a huge amount of sunlight that was previously reflected back into space is now instead getting absorbed by oceans. Do you ever wonder why everything is business as usual while the signs of dramatic weather change are all around us. Something is wrong with the messaging regarding global warming - climate change. Most of what is presented is not palatable to the general public or to those who are in charge and able to contribute to the bigger picture problems. The science may be sound but the messaging is not clear. Yes, I often wonder about that, Doug. I've tried a lot, as have many others. If anyone has any ideas, do post at the Arctic-news group. I have always wondered why most people can’t see with their own eyes that the world (weather) is changing (rapidly) right before their eyes. I have also wondered why the scientific community hasn’t figured out that most people in general (including most politicians) have little or no grasp of basic science, especially when you fill your messaging with buzz words and acronyms. Think about it this way. Once you include a secondary language (scientific) to your messaging, the messaging immediately becomes inaccessible to the general public. I know you still have to maintain the nuances and accuracy of what you’re trying to get across, but to the average person, most of what is being said sounds convoluted and out of sync. I think the scientific community needs to slow down a communications step or two to get this urgent and necessary messaging out to the masses. Not an easy task but one worth pursuing. Basic questions and answers, straightforward analogies, specifics, interesting stories, no jargon, and a proper non-scientific presentation, and then learn from the feedback to make the adjustments to the next set of messages. There is no one I know in any walk of life who does not want to understand better, the crisis situation our planet is in weather wise today. I suggest a way to make it clear and urgently relevant is to say something like: We are in imminent danger of not having food and water for everyone. Imagine what things will be like when people are hungry and no food available. The changes in the climate are disrupting the weather over the places where we grow our food. These changes are producing floods, droughts and temperature shifts that are reducing crop production. It is getting more severe month by month. It is only a matter of time before it affects the major crop producing areas and it already has in Russia. Imaging being a farmer when the rain comes too early or too late...the warm times come too early or too late....and the crops fail. There will not be enough food to feed everyone. This is already happening and will increase dramatically. We need to ACT RIGHT NOW or watch many of our children grow weak and fail with hunger. This is already happening to our shame. Acting "right now" will solve nothing. Latency, lag time, feedbacks, ect, [label it as you wish] are in full force as evidenced by a rapid shift in our climate/weather. People such as Sam Carana & James Hansen are indispensable for the few who realize we are in a 6th mass extinction event..